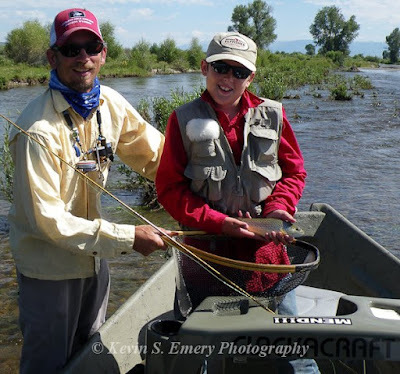 LIFE IS FLY, LLC: Kevin Emery's Fly Fishing Guide Service: Snap, crack, ping, OMG did you see that? Snap, crack, ping, OMG did you see that? We had the most amazing day on the river. I spent the day with return clients Jacob (age 11) and his father David. The day was filled with big fish. I mean really big! 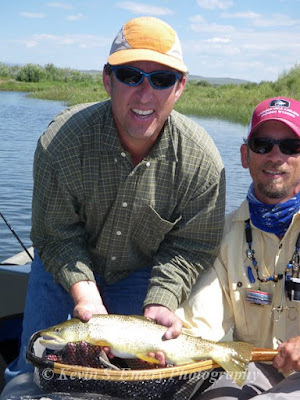 So big that, David hooked into a (small dog) Brown trout well over 20". Well, we're not really sure since we never landed the fish. However, in a 4 second time frame, David casted out and hooked the "pig". In an instant, the "pig" ran straight under the boat and...... that's when the rod snapped at the mid point. There was nothing we could do except smile, pick up our jaws and start to giggle. WOW! That was really cool.